Everything the same, everything different. 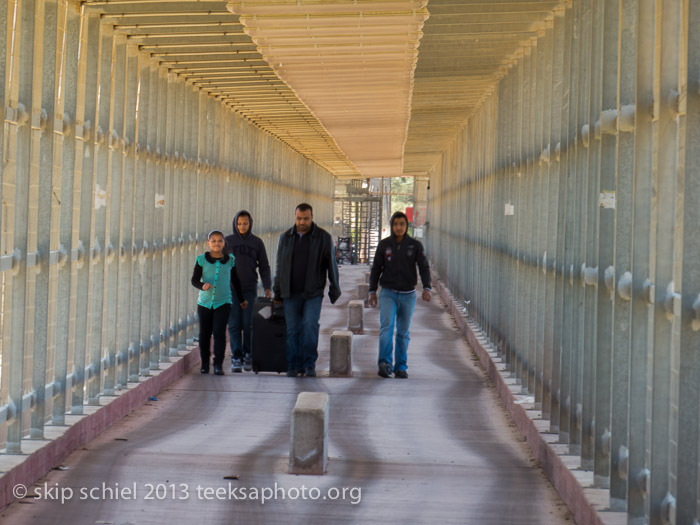 That’s how I’d describe my current feeling upon arrival in Gaza yesterday [March 24, 2013]. Familiar surroundings and people in Gaza (this is my 6th visit), entirely different from the way I usually live and with whom I live and interact back home. From Jerusalem to the Erez crossing from Israel in about 90 minutes, paid for by the American Friends Service Committee with whom I work in Gaza, very smooth. 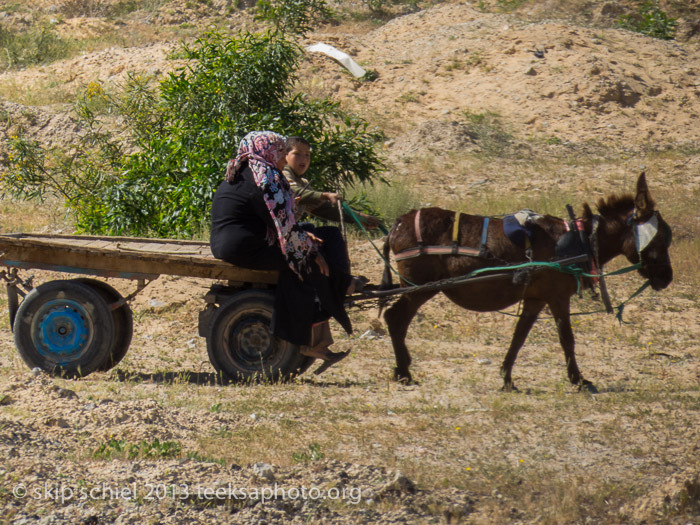 The road narrowed and became more potholed the nearer as we approached Gaza. The driver was friendly but not communicative, probably the language differences. He has one young daughter, I told him about my family. He’d like to visit Gaza, but can’t because of Israeli restrictions. So much for that conversation. 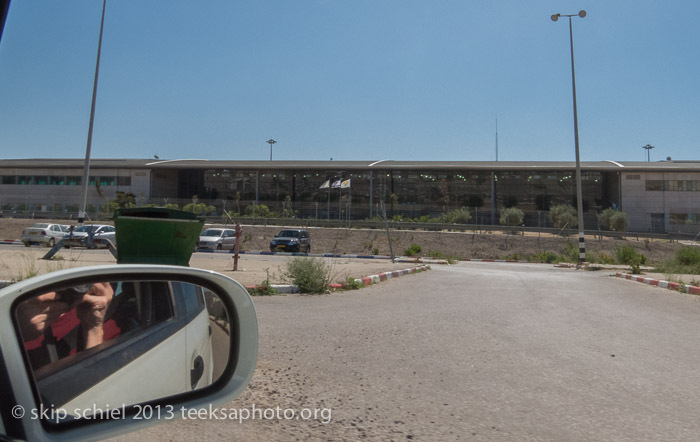 Entering the border crossing or checkpoint, a massive one, buildings expanded significantly since I was last here in winter 2010, a young woman (behind glass and placed higher than me) interrogated me for about 5 minutes. Her first question was are you a journalist? I slipped and said, sort of, well no, not really. (I might have been barred had I identified as a journalist.) Doing what, with whom, who is the American Friends Service Committee, what do they do, why photography, photography for what and whom, etc ? I was puzzled by these questions since I had a permit. Is honoring such a permit conditioned on giving proper answers? 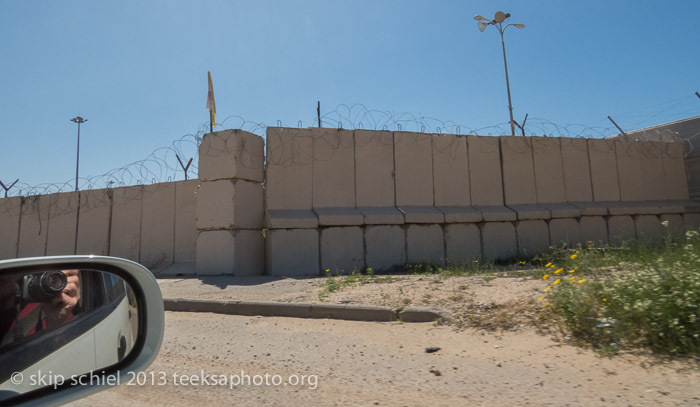 As I wrote my Levant list, with photos: One might ask: by what right does Israel control entrance into Gaza? The entrance hall is much larger than is probably needed. I’ve never seen more than a handful of people using it. Like a facility built for the Olympics and then the Olympics are cancelled, rendering the facility useless. I observed a family of Palestinians, 2 women, both obese, one very elderly, with a small child, going thru the turnstile—with wheeled luggage. All had problems. Had I not been under surveillance by the ubiquitous cameras I would have made photos. First the luggage, jammed thru, stuck, pushed, ejected, then the woman. The older woman held onto the turnstile as she painfully inched thru. And she could walk. What about those who can’t? 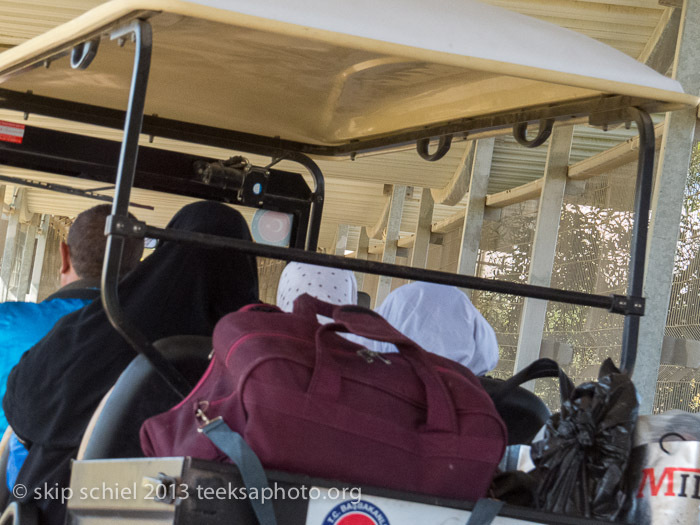 A motorized cart awaited her and drove the small family the 2 or so km to the exit point. Once past the prying cameras I pulled out my own and photographed fences, corridors, more motorized carts, walkers, etc. No rubble collectors like I had spotted 2 years ago, but I observed one tent with about 4 young men and boys in it, which I photographed, and another ramshackle structure that might have been a temporary dwelling. Do people risk their lives out here or has Israel relented slightly and does not fire on them? 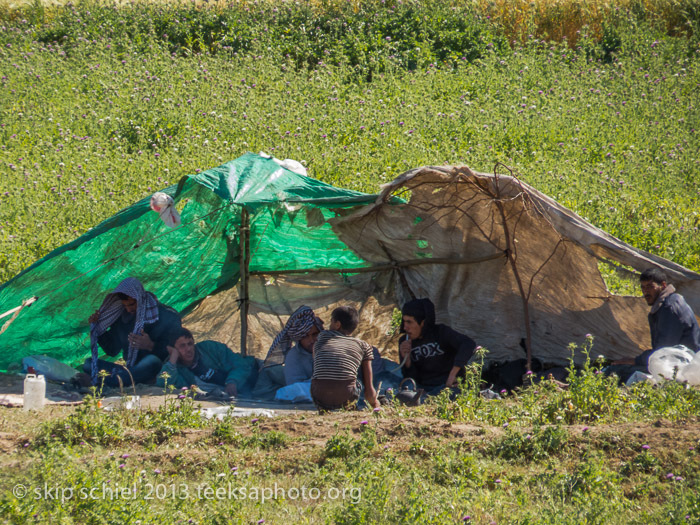 I learned later that after the so-called Pillar of Cloud operation last November, when Israel again assaulted Gaza, 8 days of unrelenting destruction, in a ceasefire agreement, Israel expanded the fishing area from 3 to 6 nautical miles. And then shrunk it again when militants fired rockets into southern Israel during Obama’s visit 2 weeks ago. After the group of Salafists (fundamentalist Muslims) admitted responsibility, Hamas arrested several men. 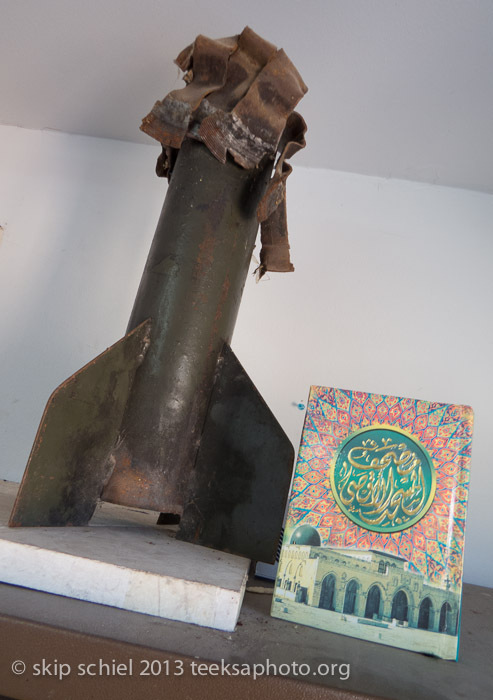 Going thru Palestinian security I photographed (with permission) an exploded Qassam rocket near a Koranic inscription, proudly displayed on top of a cabinet in the inspection office. As if to state, our religion sanctions violent resistance. The luggage check was cursory. Had I brought with me some booze and stuck it near the bottom of the luggage I doubt the inspector would have found it (unlike the last time I tried that). Luckily he did not find my medicinal pill cache. How would I explain this? Not drugs sir, simply meds. Here, try one. No questions by these officials. And of course the architectural differences between Israel and Palestine are dramatic, indicating power and wealth disparities very clearly. First stop, the AFSC office where the director, Amal, greeted me and accepted a hug with cheek kisses (Only for Skip, she told a colleague). Islam greeted me with a bear hug, Mosab greeted me with hugs and cheek kisses, and I met some new staff, the taciturn Hamed, and a grim fellow stuck at his computer. My good friend Ibrahim was on his way to Tunisia with Firas for a World Social Forum, and Rana is out for 1 month after she slipped on oil and broke her leg. No sign of the ever-present cleaning woman with her insistent and incessant smile. They asked if I was glad to be back. Oh yes, very glad. When I enter the region, Palestine-Israel, I feel happy, mabsut. However, when I enter Gaza I am super happy, very mubsut. 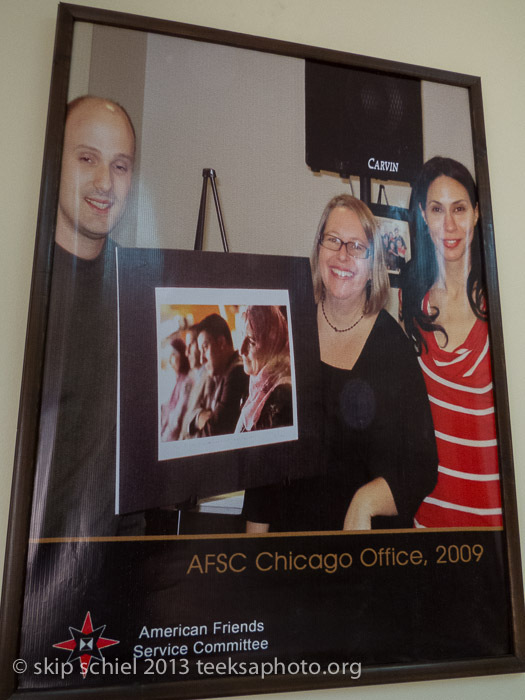 Wandering around while staff met to hire new personnel for a documentation project (that I might help with) I discovered a poster in Amal’s office showing 3 Chicago AFSC staff, Jennifer Bing, Miriam somebody, and a man I didn’t recognize. They smiled at the camera as Jennifer stood beside the photo I’d made of Amal at a Popular Achievement Program festival in Gaza in 2009. This pleases me, as I told Mosab, often much more than money. You’re off and running! That’s Miriam Rashid, BTW. Document! Teach! Live! Enjoy, Skip. ah right, rashid. i corrected that. thanks, anne, for the sweet crisp words of support. 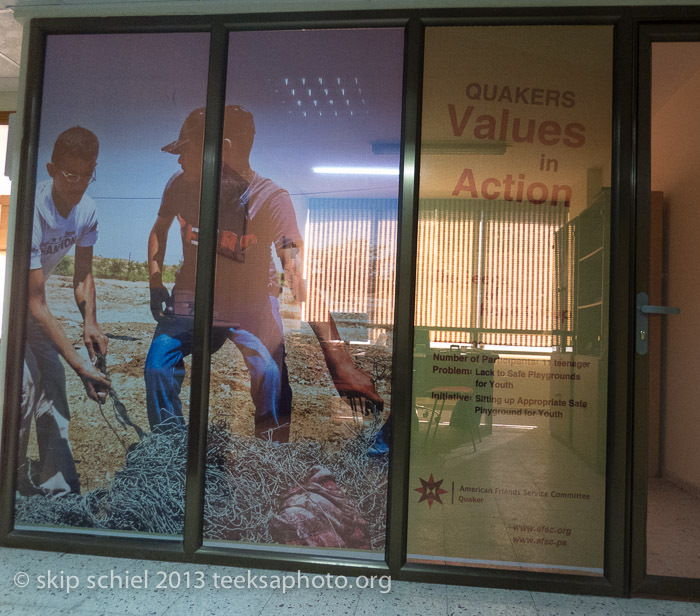 This is what we Quakers and those who support AFSC need…visual contact and information to grow stronger connections. As part of the Sister City team for Burlington VT/Bethlehem/Arad, I’m wondering if other USA cities/towns might approach Sister City International to sister with the various communities of the Gaza Strip? good idea, cliff, thanks for posting it. 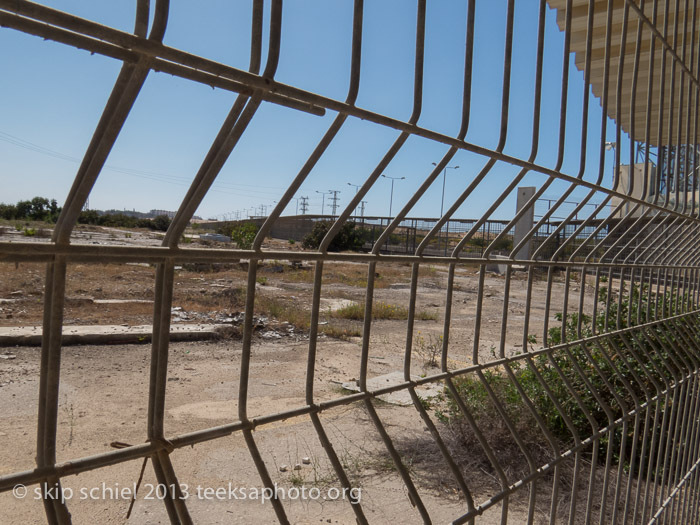 To join my email list about my spring 2012 experiences in *PALESTINE-ISRAEL *, and for postings related to that issue and very personal reflections and photographs, please reply with SUBSCRIBE LEVANT in the subject line. To subscribe to my *PHOTO-MOVIE* list, what I make (on a variety of topics), plus relevant other information and examples from other photographers. I’ll send links (average 1-3 links per week), not actual photo files. If interested, please respond with SUBSCRIBE PHOTO-MOVIE. 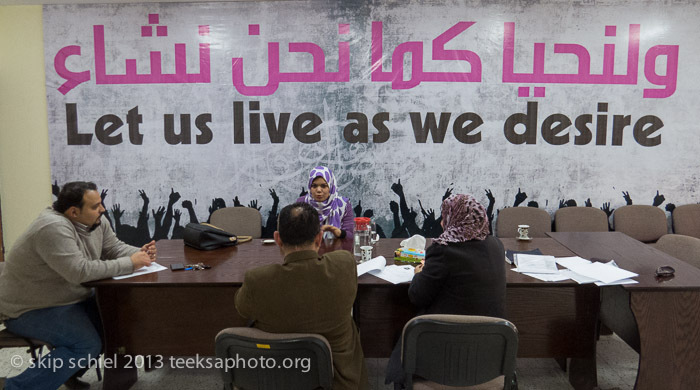 amal, you are one of the main reasons i can and wish to return to gaza, simply stated.